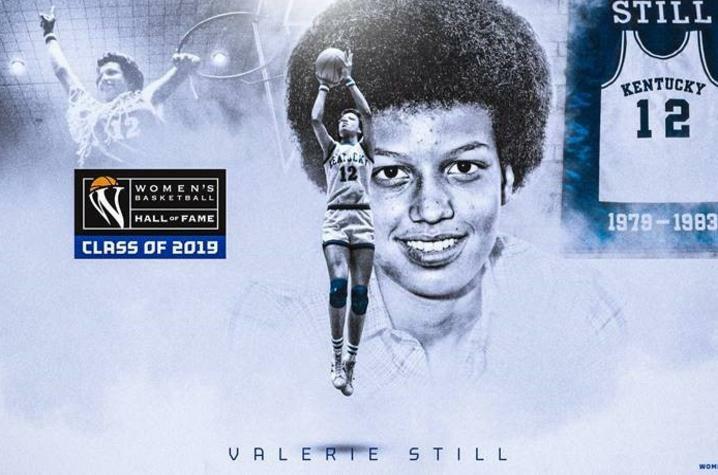 LEXINGTON, Ky. (Feb. 7, 2019) — The all-time leading scorer in both men’s and women’s basketball history at the University of Kentucky — Valerie Still — has been announced as one of seven 2019 inductees into the prestigious Women’s Basketball Hall of Fame. The Class of 2019 was selected from a list of 12 finalists and announced on ESPN2. The 2019 induction will mark the 21st anniversary of the Women's Basketball Hall of Fame, which held its grand opening and inaugural induction in 1999. The Class of 2019 will be officially inducted June 8, in Knoxville, Tennessee. Still is joined in the Class of 2019 by Beth Bass, Joan Cronan, Nora Lynn Finch, Ticha Penicheiro, Ruth Riley and Carolyn Bush Roddy. Although Still played long ago (1979-83), she remains among the top Wildcats in UK’s women basketball annals. She was honored as such on Jan. 12, 2003, with a jersey retirement ceremony at halftime of the University of Alabama game. She became the first female letter winner in any UK sport to have her jersey retired. Still is the leader among all Wildcats (men or women) for career scoring (2,763) and rebounding (1,525). She was a three-time consensus All-American and led the program in scoring four-straight seasons with a career average of 23.2 points. At one point during the 1981-82 season, she led the nation in both scoring and rebounding before finishing second in both categories (24.8 ppg and 14.3 rpg). Still led the Cats to their highest national ranking (fourth) in 1983 and helped UK roll up a 30-game home court win streak from 1980-82. In 1983, Still led the sixth-ranked Cats to an 80-66 upset over powerhouse Old Dominion University before a record crowd of 10,622 in UK’s Memorial Coliseum. After leaving Kentucky, Still had a successful career in the Italian Professional League. While in Italy, Still was a television actress and hosted her own TV show, “Still Basket.” She is also an accomplished print model and a professional caliber jazz, pop and concert pianist. Upon her return to the United States, Still became a charter member of the American Basketball League for Women and was a two-time MVP of the ABL Championship Series. Still later played for the Washington Mystics of the WNBA before retiring from basketball. She also was an assistant coach for the Orlando Miracle for two seasons. Still returned to Lexington to complete her degree in animal sciences and graduated with honors in 2001. She went on to earn a master’s degree in African American and African studies at The Ohio State University. In September 2005, Still was inducted into the charter class in the newly created UK Athletics Hall of Fame. She was the only female of the 88 inductees. For more information on the Kentucky women’s basketball team, visit https://UKathletics.com or follow @KentuckyWBB on Twitter, Instagram and Snapchat, or Kentucky Women’s Basketball on Facebook.